In fact, according to the New America Education Policy Program, there are only five other states aside from Pennsylvania—Alaska, Idaho, Michigan, New Jersey, and New York—without laws of any sort that require districts to provide kindergarten. Nevertheless, because of the changes to the public education system that have come about as a result of Pennsylvania’s Common Core-based academic standards, not only do nearly 400 of Pennsylvania’s 500 school districts offer kindergarten—they offer full-day kindergarten only. That’s because school districts are finding it difficult to cram all the Common Core requirements into the more traditional half-day. Of course, that still leaves roughly 100 Pennsylvania districts with either half-day kindergarten or no kindergarten at all. If you and your spouse both work full-time—or if you’re a single parent who works full-time—that can make life with kindergarten-aged kids incredibly challenging. In Holland, PA, for instance, Sol Feinstone Elementary School in the Council Rock School District only offers half-day kindergarten. If you live in the Council Rock District and need a child care alternative for the other half of your day—or even the entire day—consider our Just Children Holland location, which is at 47 Bridgetown Pike in Feasterville. Our Just Children Hilltown location, at 4030 Bethlehem Pike in Telford, also offers full-day kindergarten. If you live in Hilltown, you’re probably in either the Pennridge and Souderton School Districts, and both of those districts only offer half-day kindergarten. We also offer full-day kindergarten at our Just Children Bensalem location (2354 Galloway Road) and at our Just Children Bishop’s Gate location in Mount Laurel, NJ (2042 Briggs Road). Our unique kindergarten curriculum prepares your child for the primary grades in a personalized, private, and nurturing environment. 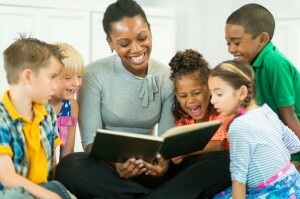 In addition to a solid academic preparation, your child will enjoy the creative arts, dramatic play, computers, and energizing gymnastic activities. To learn more about our kindergarten curriculum and the locations where it’s offered, don’t hesitate to get in touch with us today.